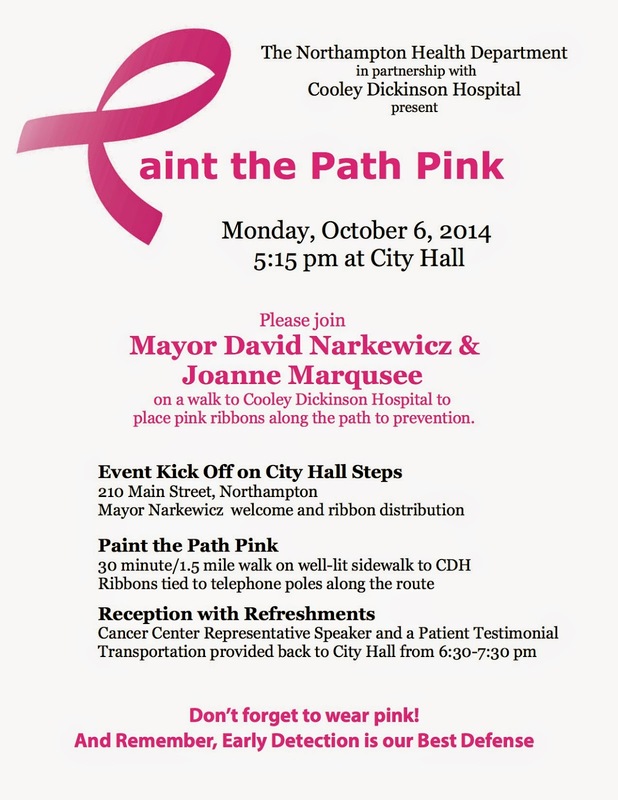 You are invited to join Mayor David Narkewicz and Cooley Dickinson Health Care President and Chief Executive Officer Joanne Marqusee on a walk from City Hall to Cooley Dickinson Hospital (CDH) to place pink ribbons along the path to prevention. The event will kick off with opening remarks from the Mayor and Ms. Marqusee on the steps of City Hall, 210 Main Street, Northampton at 5:15 pm. They will hand out pink bows which will then be placed on telephone poles during the 1.4 mile walk to Cooley Dickinson Hospital. Following the walk, in the corridor of the Hospital’s Main Entrance, there will be a reception with refreshments, with brief remarks by Dr. Lindsay Rockwell, followed by a patient testimonial.